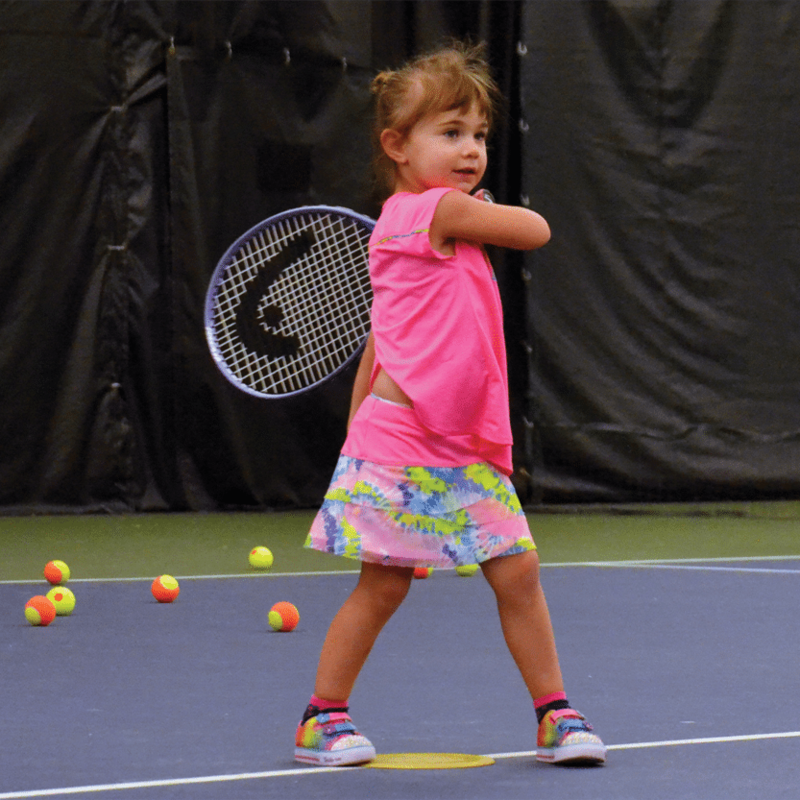 HCCTA offers classes for all ages (pre-K to Adult) and abilities. Shelly Wild is the HCCTA Carmel Site Director and will be running all Carmel classes. Red Ball Ages 4-6: For ages 4-6, 30 minute class. 48-foot court, using low compression red balls. Some kids in this age group may be better suited for the one-hour red ball class. The determining factor is if your child can focus and follow directions for an hour. Red Ball Ages 6-10: For ages 6-10, hour long class. 48-foot court, using low compression red balls. For beginner players to learn to rally, serve and begin point play. Introduction to basic stroke production techniques. Advanced Red Ball Ages 6-10: For ages 6-10, hour long class. 48-foot court, using low compression red balls. For players that have mastered the skills in the Red Ball class and are ready for the next step. Orange/Green Ball Ages 8-11: For ages 8-11, hour long class. 60-foot court, using orange and green dot balls. Players have completed and mastered red ball and advanced red ball ages 6-10 classes. Players are able to maintain a minimum 10-ball rally with another student. Emphasis on advanced stroke production and point play. Beginners Grades 6-12 & Orange/Green Ball, Grades 6-12: For Grades 6-12, hour long class for older kids that are new to tennis. Players will learn how to rally, athletic development/movement, court positioning, scoring, and basic stroke fundamentals. Class will use rally-based drills with red and orange balls, progressing through the use of lower compression balls to ensure success in point play. Advanced Beginners Grades 6-12: For players that have completed and mastered Beginners Grades 6-12 class. Real Ball Junior Progression: Hour and a half class for kids that have completed and mastered the Beginners Grades 6-12 and/or Advanced Beginners Grades 6-12 class and are ready to progress from low compression ball rallies. For players that are real ball intermediate to advance levels. Adult Beginner: Class for adults that are new to tennis. This is a rally-based drill program to get players hitting back and forth over the net with a partner within the first 15 minutes of class. Students will focus on basic fundamentals to ensure a sound technical foundation. Adult Drill and Play (2.5-3.5) A combination of fed and live ball drills in a fast paced environment. Beginner – Has taken 0–5 tennis classes. Cannot rally back and forth. Does not know how to start in ready position and determine if they should hit a forehand or backhand. Still needs work on their form and hand position on their racquet. Cannot run to the ball and consistently hit it over the net. NOTE: Even if your child has taken a few clinics, they may still be at the beginner level. Intermediate – Knows their forehands and backhand ground strokes and volleys, and has proper swings without help from an instructor. Places hands properly on the racquet (dominant hand on the bottom). Knows how to start in ready position and can determine if they are supposed to hit a forehand or backhand. Has been working on running to the ball but still needs more work on this. Has started to learn serving but still needs to work on it, and cannot hit their serves in consistently. Has started to learn how to rally back and forth but is unable to hit the ball consistently over the net. Advanced – Can hit the ball consistently back and forth. Can rally and play matches using one bounce. Knows volleys, groundstrokes and serves and can hit all of them consistently. Knows how to serve consistently. Can keep score using love, 15, 30, and 40. Competitive – Have been playing singles and doubles matches regularly for more than 2 years. Plays varsity on their junior high team or plays on their high school team. Are able to rally back and forth 20 times or more. If your child plays on their school team but is not able to rally back and forth 20 times or more they should remain at the advanced level.